Analytica sees the launch of a new range of entry level spectrophotometers from Jenway. The 73 Series spectrophotometers use icon-driven software and have an improved navigation system, making these instruments extremely simple and intuitive to use. The new range includes four spectrophotometers; models 7300 and 7310 cover the visible region of the spectrum; models 7305 and 7315 use a flash xenon lamp to extend the wavelength range into the UV region of the spectrum. All four models have a spectral bandwidth of 5nm and an absorbance range of -0.3 to 2.5A. The two basic models, 7300 and 7305, feature measurement modes for absorbance, % transmittance and concentration. 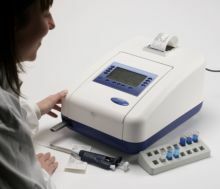 The advanced models, 7310 and 7315, introduce additional measurement modes such as scanning, kinetics and quantitation. The advanced models incorporate an easy access USB port on the front of the unit, enabling results to be stored directly to a USB memory stick for fast transfer of data. These spectrophotometers can also store up to 240 methods which may be copied from one unit to another using the USB capability. The advanced 7310 and 7315 models have enhanced security features allowing the instrument and methods to be locked, preventing unauthorised changes to the instrument settings and method parameters. The home page can also be customised and selected modes restricted - ideal for teaching laboratories. All four models are supplied with free bi-directional PC software which enables the units to be controlled via PC. The software suite also provides enhanced post-measurement tools and easy exportation of results to Microsoft Excel. The entire range has been designed to allow the user to quickly and easily set up and navigate the measurement modes. Soft keys adjacent to the intuitive icons remove the need to use arrow keys to navigate the instrument and the removal of language-based text means there is no need for translation. The new 73 Series spectrophotometers are all covered by a three year warranty which includes the xenon lamp. There is also an extensive range of accessories available to increase productivity and meet the needs of any laboratory. Bibby Scientific will be exhibiting on stand B2.217 at Analytica 2010, 23-26 March in Munich, Germany.